A novel crystalline structure of hybrid monolayer hexagonal boron nitride (BN) and graphene is predicted by means of the first-principles calculations. This material can be derived via boron or nitrogen atoms which are substituted by carbon atoms evenly in the graphitic BN with vacancies. The corresponding structure is constructed from a BN hexagonal ring linking an additional carbon atom. The unit cell is composed of seven atoms, three of which are boron atoms, three are nitrogen atoms, and one is a carbon atom. It shows a similar space structure as graphene, which is thus coined as g-B3N3C. Two stable topological types associated with the carbon bond formation, i.e., C-N or C-B bonds, are identified. Interestingly, distinct ground states of each type, depending on C-N or C-B bonds, and electronic bandgap as well as magnetic properties within this material have been studied systematically. Our work demonstrates a practical and efficient access to electronic properties of two-dimensional nanostructures, providing an approach to tackling open fundamental questions in bandgap-engineered devices and spintronics. Two-dimensional (2D) nanomaterials, such as graphene and monolayer hexagonal boron nitride (h-BN), are expected to play a key role in future nanotechnology as well as to provide potential applications in next-generation electronics. Recently, novel hybrid structures consisting of a patchwork of BN and C nanodomains (BNC) were synthesized through the use of a thermal catalytic chemical vapor deposition method. This finding immediately has attracted a great deal of research interest[2–4], given that it demonstrates a hitherto efficient route to tune the bandgaps of these 2D materials. It is well known that the perfect hexagonal and planar structure of BNC largely depends on the good matching between BN and C domains. However, it is indeed an outstanding challenge as BN and C phases are naturally immiscible in 2D. This explains why Ci et al. could observe some wrinkles in the atomic force microscopy image. Such mutual contradiction mainly originates from the domain boundary effect and the staggered potentials of B and N atoms in BNC, which doubtlessly affects their continuous tunable electronic energy gaps. It has been confirmed in the related theoretical calculations[5–9] where the bandgaps show a strong oscillation feature. The X-ray photoelectron spectroscopy of BNC measured in the work of Ci et al. shows two additional types of C-bonding configurations, which correspond to the C-B and C-N bonds with the bonding energies of around 188.4 and 398.1 eV, respectively. This feature means that two inequivalent C-bonding types, i.e., C-B or C-N bonds, must be present in the boundaries of the hybridized BN and C domains, which have a significant effect on determining the local structures and subsequently vary the electronic properties in this system. For example, the transport channels show a robust characteristic gap when the topological index changes the sign of the valley Hall effect. In addition, both Raman D band at 1,360 cm−1 and D’ band at 1,620 cm−1are also observed in BNC, which were attributed to the lattice disorder or the finite crystal size. This lattice disorder effect might directly introduce vacancies to this 2D hexagonal system[10–12], which is also true in BNC as shown in Figure two (a) of. For the planar BNC structure, although the larger domains would be preferred to decrease the total domain interfacial energy, the randomly distributed hybrid domains and the immiscible phases, as well as the induced vacancies, must result in various complex structures of BNC[13–16]. An immediate consequence is the largely inaccessible synthesis of expected BNC in experiments, which next hinders realization of bandgap-engineered applications in actual devices. In this endeavour, exploring the structures and electronic properties associated with C bond formation in BNC which contains C-N or C-B bonds is an interesting topic that must be addressed before widespread synthetic applications. Thus, a simple model of BNC where the C bonds play a crucial role must be considered again. More importantly, a deep theoretical understanding, which originally was concealed behind the complex hybridized structures, is imperative. 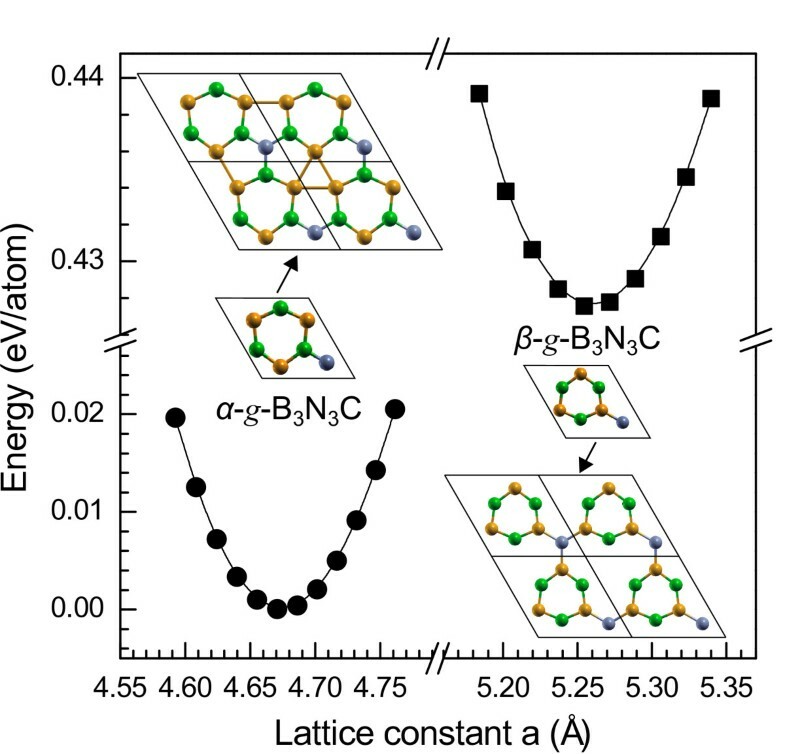 Here, we report that such a simple model of BNC may be just the graphitic B3N3C (g-B3N3C), which is a perfect 2D monolayer graphite-like structure as shown in Figure1. As mentioned above, the C atom can bond to B and N atoms. Therefore, two topological types of g-B3N3C are easily deduced. One is the α-g-B3N3C which is related to the the higher bonding energy of the C-N bond, while the other one is the β-g-B3N3C which is constructed based on the lower bonding energy of the C-B bond. It can be seen that such a material is essentially a C-doped graphitic BN (g-BN) with vacancies. The substitution of the N/B atom with a C atom in g-BN with the B/N vacancy will yield the α/β-g-B3N3C structure. The interactions among the C atoms and/or vacancies as well as the C-bonding types (C-B and C-N bonds) in g-B3N3C significantly alter its electronic properties. To explore this effect, standard density functional theory with different functional (see the following discussion) calculations has been carried out for this predicted material. Remarkably, such material displays two distinct electronic structure properties: α-g-B3N3C is a semiconductor, while β-g-B3N3C behaves like a metal and leads to a magnetic ground state. The total energy per atom as a function of lattice constant a for g -B 3 N 3 C. Yellow, green, and gray balls represent B, N, and C atoms, respectively. Their respective 2×2 supercells are also given nearby. This paper is arranged as follows: In the second section, we present the computational method used in this work, followed by the electronic bandgap in α-g-B3N3C and magnetism in β-g-B3N3C in the third section. We then conclude this paper in the fourth section. For structural optimization, we employed density functional theory with the generalized gradient approximation (GGA) of Perdew-Burke-Ernzerhof (PBE) for the exchange-correlation (XC) potential within the projector augmented wave method as implemented in VASP[19, 20]. An all-electron description, the projector augmented wave method, is used to describe the electron-ion interaction. The cutoff energy for plane waves is set to be 500 eV, and the vacuum space is at least 15 Å, which is large enough to avoid the interaction between periodical images. A 7×7×1 Monkhorst-Pack grid is used for the sampling of the Brillouin zone during geometry optimization. All the atoms in the unit cell were allowed to relax, and the convergence of force is set to 0.01 eV/Å. Additionally, spin polarization is turned on during the relaxation processes. All other calculations of accurate electronic properties were performed using the full-potential linearized augmented plane-wave method as implemented in the WIEN2k code. It is well known that different XC potentials can lead, depending on the studied materials and properties, to results which are in very bad agreement with the experiment, e.g., for the bandgap of semiconductors and insulators which is severely underestimated or even absent. For this reason, the modified Becke-Johnson (MBJ)[24, 25] potential in the framework of local-density approximation (LDA)[26, 27] is taken to calculate the bandgap of α-g-B3N3C, while the magnetism in β-g-B3N3C is described by the PBE (the standard GGA for materials) potential. Figure1 plots the total energy per atom against the lattice constant a (the lattice constant c is fixed) for g-B3N3C. It can be seen that the total energy of g-B3N3C as a function of lattice constant a has a single minimum, meaning that the geometrical structure would be stable. Particularly, the charge population analysis reveals that the electron density around the C-N bond in α-g-B3N3C is much higher than that around the C-B bond in β-g-B3N3C, showing that the C-N bond is relatively strong, which is also consistent with the experimental results. This strong interaction between C and N atoms in α-g-B3N3C directly results in a short C-N bond length (see the following paragraph) and can balance the strain of the monolayer graphite-like structure. Thereby, α-g-B3N3C could be a more thermodynamically stable topological phase against β-g-B3N3C, which has a lower total energy of around 0.43 eV/atom compared with β-g-B3N3C. To explore further the mechanical stability of α-g-B3N3C, the optimized lattice constant a = 4.67Å is first obtained, as depicted in the left panel of Figure1. Importantly, the C-N bond length converged to 1.31 Å, which is considerably reduced from the typical bond lengths of 1.37 to 1.48 Å in the related materials. This strongly suggests the nature of the higher binding energy of the C-N bond, which also influences the B-N bonding and extends its length. The obtained B-N bond length is 1.48 Å, which is slightly bigger than the value of 1.45 Å in h-BN. The calculated partial density of states (PDOS) is shown in Figure2. The valence band is dominated by B p and C p states, while the conduction band is only dominated by B p states. There, one can find the majority of C p states to be semicore, lying 6 to 9 eV below the Fermi level. These states interact with those comprising the valence band with the same symmetry. As a result, there is a small admixture of C p and N p states close to the Fermi level. However, in α-g-B3N3C, one finds significant admixture of C p and N p states in the semicore energy window with 6 to 9 eV below the Fermi level. This suggests that the C p-N p interaction in the semicore region contribution to the C-N bonding is significantly more important in α-g-B3N3C than the C p-N p interaction close to the Fermi level. Total and partial DOS of α - g -B 3 N 3 C for three XC potentials LDA, PBE, and MBJ. The vertical dotted line denotes the Fermi level and also indicates the end of the fundamental bandgap which starts at E − EF = 0eV. The black, blue, and red lines correspond to the total, p, and s DOS, respectively. Now, let us look at the band structures of α-g-B3N3C, as given in Figure3. It explicitly demonstrates that all three XC potentials give similar band structures. The highest occupied crystalline orbitals are located at the K point of the reciprocal space, while the lowest unoccupied crystalline orbitals appear at the M point. This leads to an indirect bandgap semiconductor. To obtain the bandgap more accurately (see Figure3c), the MBJ XC functional is used[24, 25]. The bandgap of α-g-B3N3C within MBJ is obtained to be 1.22 eV, which nicely locates the middle region between 0.59 and 1.80 eV for the BNC samples with 12.5% and 50% C contents, respectively. Note that the C content in α-g-B3N3C is 25%. In the experiments, the absorption edges are redshifted as the C concentrations increase, which shows a tunable mechanism of an optical bandgap in actual applications. By comparing with where BNC with around 65% C concentration shows an optical bandgap of 1.62 eV, we infer that such a higher energy absorption edge (take into account the bandgap of 1.22 eV in our case with 25% C concentration) arises from the formation of individual BN and graphene domains. In this way, the even distribution of C in BNC systems might serve as a good guide to find alternative solutions to existing bandgap-engineered applications. Future research can test this prediction directly. Calculated band structures for α - g -B 3 N 3 C model with the three XC potentials. (a) LDA XC potential. (b) PBE XC potential. (c) MBJ XC potential. In addition, the bandgaps based on the LDA and PBE methods are equal to 0.83 eV (see Figure3a,b). The relative bandgap correction from MBJ with respect to LDA, R = ( Δ MBJ − Δ LDA ) / Δ MBJ with ΔMBJ/LDA being the bandgap, is about 32%. We can see that our calculated R for α-g-B3N3C ( shows an excellent agreement with the 16 sp semiconductors) lies within the range of 16.0% to 100.0% (see Table1 for details). The correction value is particularly very close to that in BN (25%), GaN (42%), AlP (37%), and AlN (25%). This finding is not surprising because the listed four solids have at least one element close to that of α-g-B3N3C in the periodic table of elements. It means that the similar chemical circumstances in these materials can be well described by the same XC functionals. This underlyingly confirms our prediction validity and that the α-g-B3N3C might be carried out experimentally. The theoretical and experimental bandgaps (in eV) of the 16 sp semiconductors are directly taken from. The relative bandgap correction R (in %) is calculated from the equation R = ( Δ MBJ − Δ LDA ) / Δ MBJ , where ΔMBJ and ΔLDA are the calculated bandgaps using XC potentials MBJ and LDA. From Figure2, which shows the DOS of α-g-B3N3C, we can see that the effect of the MBJ potential is to shift up (with respect to LDA/PBE) the unoccupied B 2s and 2p states. Here, three major differences between the LDA/PBE and MBJ methods can be extracted: (a) Another obvious effect of MBJ potentials is to shift down the middle of the valence band at around −4.0 eV. 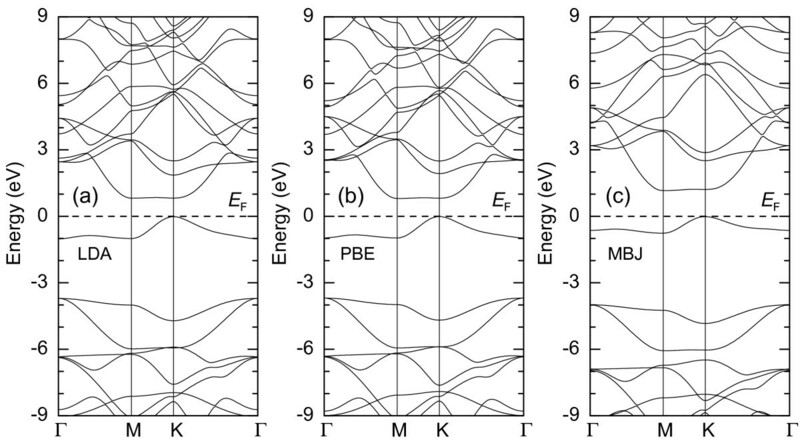 (b) The hybridization of s and p states of dominant B 2s and other atoms’ 2p states at the bottom of the valence band is very strong in MBJ calculations (denoted as down arrows in Figure2). (c) The correction character of α-g-B3N3C is much more pronounced with the MBJ than with the LDA/PBE, which narrows the valence band just below the Fermi level. We would like to stress that the MBJ potentials open a bandgap of 0.39 eV in the α-g-B3N3C model compared to the result of LDA, which is consistent with the orbital-dependent potential principle. 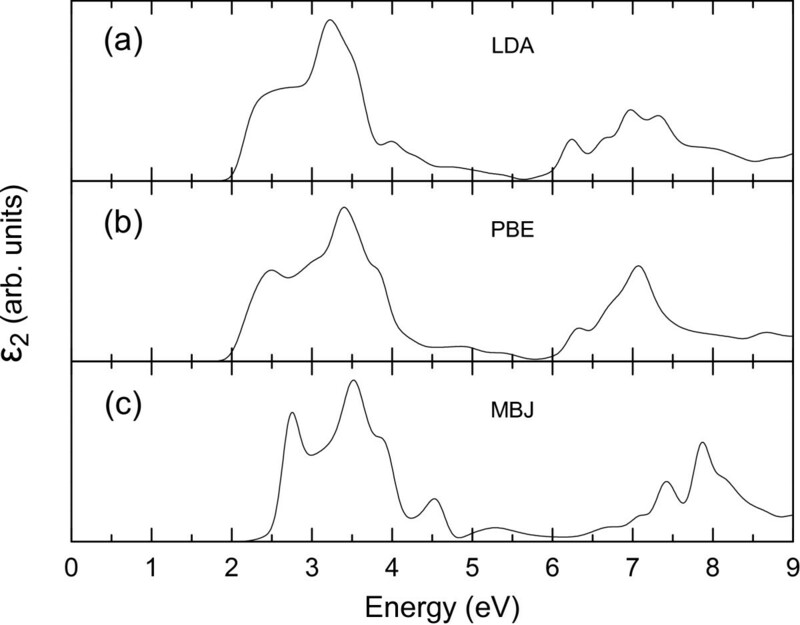 The optical absorption spectrum for α-g-B3N3C within MBJ potentials (see Figure4c) shows a big absorption packet with two adjacent peaks in the range of 2.5 to 5.0 eV, which originates from the band structure as shown in Figure3c. As an indirect bandgap material, the transition from the K point to Γ point is very weak as the momentum conservation rule is not satisfied here, and thus, the corresponding characteristic photoluminescence in the optical absorption spectrum can be negligible. This is also true in our case for α-g-B3N3C. The first peak corresponds to the direct bandgap transition at the M point. The second peak comes from the larger direct gap from higher energy states located at the Γ point. More importantly, these two peaks are not separated distinctly. This feature can be attributed to the even distribution of C atoms in α-g-B3N3C as mentioned above, which shows a different formation mechanism compared with the hybrid BNC in the experiment. The optical absorption expressed by the imaginary part of the dielectric tensor ε 2 for α - g -B 3 N 3 C. The imaginary part of the dielectric tensor is averaged for four different directions. Three XC potentials including (a) LDA, (b) PBE, and (c) MBJ are shown in the calculations. Correction effects were taken into account by adding a LDA correction potential in MBJ. This important physical effect opens an additional bandgap by mimicking very well the behavior of orbital-dependent potentials and causes a rigid blueshift of the absorption spectrum compared with the LDA/PBE curves as shown in Figure4. This explains the excellent qualitative agreement of the hybrid exchange-potential optical absorption spectrum seen in Figure4, due to a compensation of significant errors within the standard DFT methods. The predicted structure of β-g-B3N3C is shown in the right panel of Figure1. The lattice constant of β-g-B3N3C is obtained to be 5.26 Å as shown in Figure1. The results show the equilibrium value dBC = 1.52 Å, which is close to the value of graphite-like BC3, which is 1.55 Å. It is to be noticed that all the equilibrium values, dBN, in α-g-B3N3C are equal to 1.42 Å, which is slightly less than the value of 1.45 Å in the pristine BN sheet. This implies the stronger B-N bonds formed in β-g-B3N3C. Our calculations show that the β g-B3N3C leads to a ground state with a magnetic moment of 0.68 μB. The nonmagnetic state is 0.07 eV higher than this ground state. From the band structures, we see that although both the pristine BN sheet and graphene are nonmagnetic, the β-g-B3N3C model can be spin-polarized. It is necessary to discuss magnetism in more detail from its electronic structures. 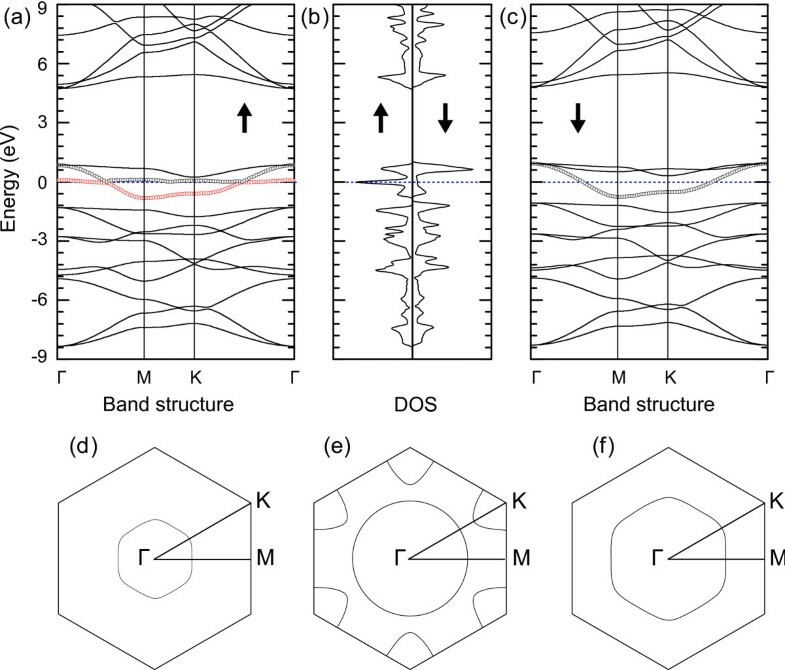 Figure5a,b,c presents the band structure and spin-resolved total density of state (TDOS). Remarkably, two bands cross the Fermi level (black and red circles in Figure5a) and make the Fermi energy level occupied completely along the entire high-symmetry lines. In contrast, the spin-down one does not possess such a strongly localized feature, just one band (black circles) crosses the Fermi level monolithically as shown in Figure5c. The calculated magnetic moment in β-g-B3N3C should originate from this asymmetric spin-dependent localization. The corresponding strong spin splitting can be further confirmed from TDOS as shown in Figure5b. In addition, close examination of the top valence bands (see Figure6a) indicates that the strong localization mainly comes from the 2p atomic orbitals of C and N atoms. Here, we also show the Fermi surfaces of β-g-B3N3C in the first Brillouin zone. The unique feature of the Fermi surface which is almost parallel to the high-symmetry lines (see Figure5d,e,f) is the direct manifestation of the bands near the Fermi level in Figure5a,c. 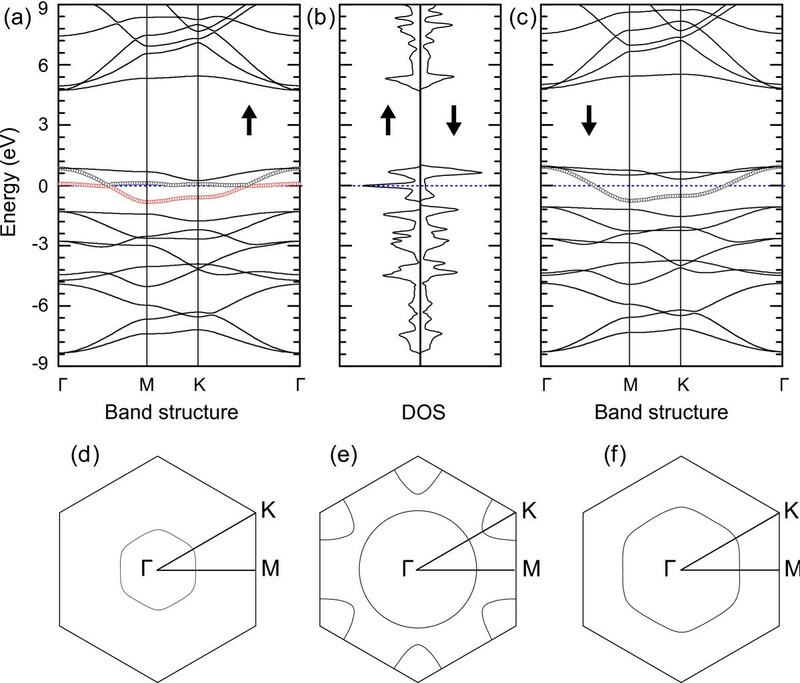 Band structures, spin-resolved TDOS, and Fermi surfaces for β - g -B 3 N 3 C. (a, b, c) Band structures and spin-resolved TDOS for β-g-B3N3C. The dotted line indicates the Fermi level. The arrow denotes the spin polarization direction: up for spin up and down for spin down. (d, e, f) Fermi surfaces drawn in the first Brillouin zone and the corresponding high-symmetry points; (d) and (e) for spin up and (f) for spin down. PDOS and spin density for β - g -B 3 N 3 C. (a) PDOS on the interstitial region and on the 2s and 2p orbitals of C and N atoms in β-g-B3N3C. (b) The 3D iso-surface plot of spin density for the 2×2 supercell at the value of 0.04 e/Å3. (c) A side view of spin density corresponding to (b). It should be noticed that such magnetism is induced without transition metals and without external perturbations so that β-g-B3N3C behaves as the first, theoretically predicted, metal-free magnetic material in the hybrid BNC system. Apparently, our finding points out a new direction for further related experimental investigations in spintronics. We now address the possibility of the origin of magnetism in β-g-B3N3C. Based on the orbital-resolved density of state as shown in Figure6a, the magnetic moment is mainly ascribed to the 2p orbitals of C and three N atoms. The spin polarization of C atom offers a magnetic moment of 0.18 μB. A total magnetic moment of 0.18 μB is shared equally by the 2p orbitals of three N atoms. The remaining magnetic moments distribute evenly in the interstitial region among N atoms. This is conceivable because β g-B3N3C, if compared with other BNC systems, has large interspaces between N atoms (see the 2×2 supercell in Figure1 or Figure6b). The remarkable feature is that the equilibrium surface density of β-g-B3N3C is around 1.27 times larger than that of α-g-B3N3C. Owing to the large interspaces between atoms, the hydrogen storage in β-g-B3N3C may be expected. The detailed description of hydrogen storage related to β-g-B3N3C is beyond the scope of this work. Concerning the special carbon atom in β-g-B3N3C, the counting of four valence electrons is as follows: Three electrons participate in the s p2 hybrid orbital, which forms a planar structure. The remaining one electron is then redistributed in the whole unit cell due to the enhanced B-N covalent bond (with shorter bond length compared with the value in pristine h-BN), which makes the magnetic properties more complicated. From the fourth electron, only 18% of the electron still fills the Π-orbital of the C atom and contributes a magnetic moment of 0.18 μB. This is in fairly good agreement with theoretical description of the Π-orbital state to the local magnetic moment of approximately 0.3 μBin the graphene-like systems[31, 32]. Around 32% of the fourth electron mainly resides at the interstitial region, which plays a crucial role in β g-B3N3C as follows: (a) enhances the B-N covalent bond, (b) provides the main interstitial magnetic moment of 0.32 μB, and (c) promotes the 2p z of the N atom spin-polarized slightly with a magnetic moment of 0.06 μBper N atom. The remaining percentage of the fourth electron acts as the conduction electrons and makes the system metallic, which dominates the mechanism of ferromagnetic ordering in β g-B3N3C. In the case of β g-B3N3C, we can see that the electron spin at the localized Π-orbital state of C and N atoms as well as the interstitial region compels two energy bands localized strictly along the entire high-symmetry lines, i.e., the Γ-M-K-Γ line (see Figure5a). Thus, the RKKY interaction[10, 33] among the magnetic sites through the residual conduction electrons forms a spin ordering in these orbitals, which is the physical origin of ferromagnetism in β g-B3N3C. Figure6b,c respectively plot the top and side views of the 3D iso-surfaces for net magnetic charge density in the xy plane. This finding is insightful, and three major points deserve comment: (a) The C site is more spin-polarized as compared with each N site. (b) The dumbbell-like magnetic moment distribution along the z direction implies that the 2p z orbital becomes partially filled with one spin-up electron. (c) The induced moments are ferromagnetic coupled between the N and C sites based on the RKKY exchange interaction model as mentioned above. In summary, we have predicted a novel crystalline material g-B3N3C, which displays two distinct electronic properties where the selective bonding type of the C atom is a key parameter for future industrial processes. α-g-B3N3C is a semiconductor, while β-g-B3N3C behaves like a metal and holds a magnetic moment of 0.68 μB. Importantly, compared with the hybrid BNC, g-B3N3C is proposed to have a simple structure, which can be applied in various fields due to its unique properties. This work was supported by the National Basic Research Program of China under No. 2012CB933101. This work was also supported by the National Science Foundation of China (NSFC) under No. 10804038, 11034004, and 50925103 and the Fundamental Research Fund for the Central Universities and Physics and Mathematics of Lanzhou University. We acknowledge that part of the work was as done at the National Supercomputing Center in Shenzhen. MSS conceived, designed, and optimized the structure of g-B3N3C. JYL performed the calculations, analyzed the data, and drew the figures. DQG, NXN, and DSX discussed the results. MSS wrote the paper. All authors read and approved the final manuscript.